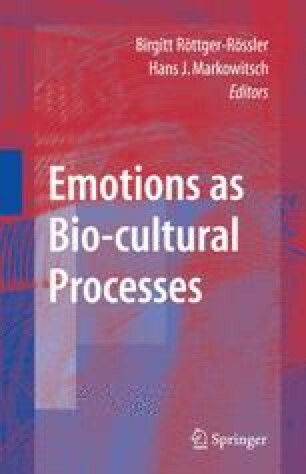 This chapter develops a theoretical framework that is capable of integrating the biological foundations of emotions with their cultural and semantic formation. It starts by investigating two leading scientific theories about emotions: one that is dominant in biology and a second one that is dominant in psychology. In biology, we consider the theory of basic emotions that focuses on innate biological emotional mechanisms. Using this approach, we can take physiological states into account. In psychology, we take a closer look at theories focusing on appraisals—the so-called appraisal theories—because these can be brought in to explain the cultural and semantic modification of biological emotional processes. Our examination of the major factors and elements of appraisal processes, which is also an examination of the internal processing of an emotional episode, discriminates unconscious from conscious processes and mental from nonmental processes. The next step is to integrate the two theories—the theory of basic emotions and appraisal theory—to couple emotional sensations with emotional concepts (semanticization). We clarify how basic innate emotional processes and complex learned ones are related to each other. We assume that cognition, feeling, and consciousness gradually become more differentiated in single species and organisms (phylogeny). Correspondingly, one possible hypothesis is that this differentiation process runs parallel on all levels, meaning that these domains can be assumed to be closely linked or even interdependent.